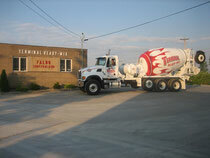 About Us - Concrete ready-mix producer and concrete road construction company, Lorain, Ohio - Terminal Ready-Mix, Inc.
Terminal Ready-Mix specializes in dock services, concrete production and construction. Located on the Black River in Lorain, Ohio, we have access to high-quality aggregates not available to other producers. Our ready-mixed concrete fleet of front and rear discharge mixers is well-maintained and the central-mix plant is state-of-the-art. We can create any mix design to meet your project requirements and we will produce it consistently. Construction of concrete roads using slip-form concrete paving equipment and skilled personnel is a specialty of ours. Terminal Ready-Mix can perform your project by hand if necessary and still delivery superior quality and service. These projects include large commercial and industrial parking lots and pads. And, because we are a concrete producer, we can control the quality of the product from mixing to finishing! Underground utility construction of waterlines, storm and sanitary sewers for private and municipal projects is performed using our fleet of equipment and experienced crews. Our excavators, backhoes, loaders, dump trucks and dozers can be loaded on our carry-all for immediate mobilization. It's our equipment, not rented, so we are responsive in emergency situations.